The idea of architecture as art is nothing new, but two recently completed homes - one in Brisbane, the other in Sydney - has taken that concept to a new level. The Mosman House on Sydney’s lower north shore and the V House, overlooking the Mooloolah River on Queensland’s Sunshine Coast, share a common palette of materials and finishes. This palette, underpinned by concrete, has become something of a signature for architect Shaun Lockyer. Lockyer has concrete stamped in his DNA, having grown up and commenced his career in South Africa, where use of the material is widespread. Since moving to Australia 19 years ago, he’s continued to explore its potential, building a reputation amongst peers and clients for homes that really do push the boundaries of materiality. 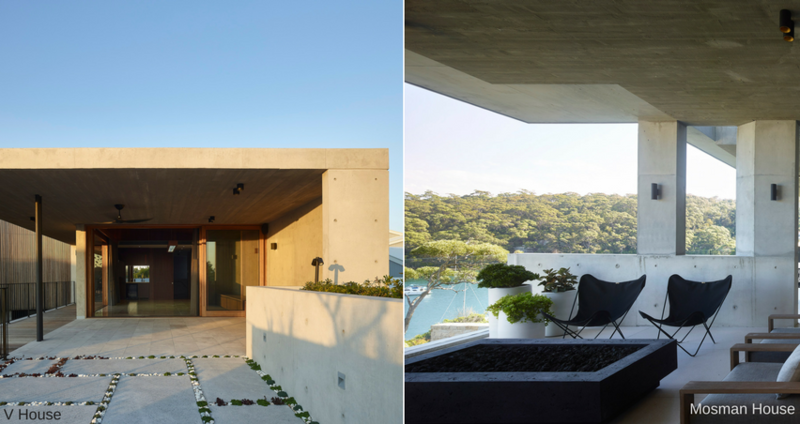 The stunning Mosman and V houses share similar characteristics in the way concrete is expressed. Both feature exposed off-form concrete slab ceilings and external and internal walls in a range of textures and finishes that are executed with a meticulous eye for detail. 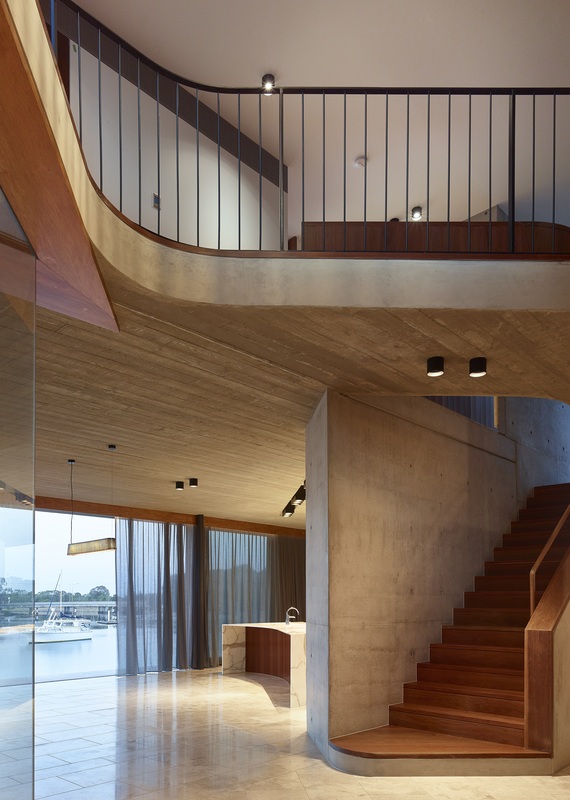 The ceilings of both homes, as well as the stairwell of the Mosman Home, have been formed up with rough-sawn Oregon boards to create a distinctive, timber-like texture. 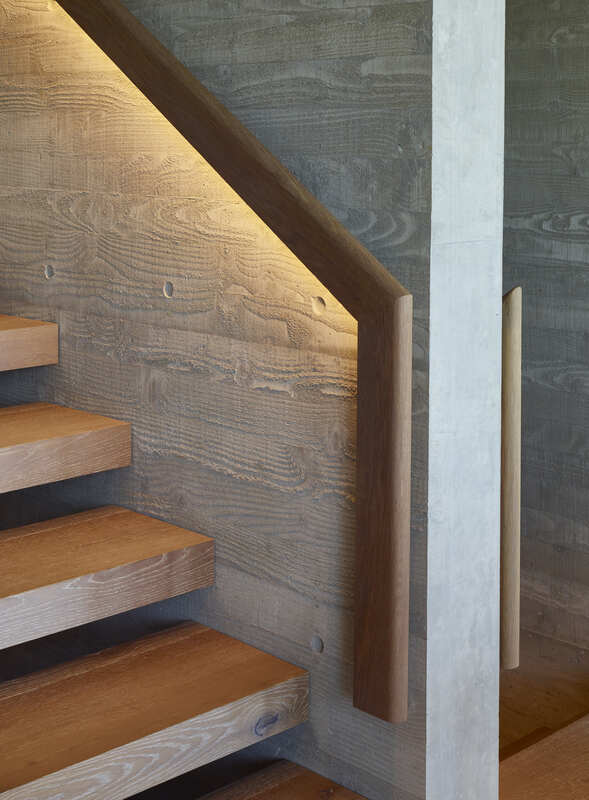 “The quality of the finish, particularly in the Mosman House stairwell, was beyond our wildest expectations,” Lockyer says. He describes the process of creating this textured finish as ‘playing mind games with the material’, transforming it from something hard and austere to something warm and soft, ‘timberish’ by feel. In preparing for the pour, the rough-sawn, tongue-and-groove Oregon boards are first water-blasted to remove any excess fibres, then laid out on a horizontal surface over conventional ply formwork and secret nailed through to the ply. The surface is then rubbed down with diesel as a release agent, and the completed formwork fixed in place ready for the pour. Lockyer typically specifies galvanised reinforcing to eliminate any spotting and a 40 mpa concrete mix rather than 32 mpa because it cures faster, which in turn means the formwork can be removed sooner than otherwise. “Because you’re pouring onto rough-sawn timber, the concrete tends to bind to the surface. So to inhibit that, we pull the forms down relatively quickly,” he says. The end result, though, is worth the effort. “You are drawn to it. You just want to touch it,” Lockyer says. “I think this emotive ability to excite a person by touch is such an important part of architecture. Because our work is not just practical – it’s poetic and it’s tactile, and hopefully resonant to the memory somewhere. Lockyer also specifies his concrete walls without fillets. Instead, by siliconing and carefully monitoring the formwork joins during the agitation process, he finds he can achieve sharp, clean edges. “Because of its plasticity, you can also create a seamless continuity between wall and roof, which is another reason why we love it,” he says. Nowhere is this continuity more evident than in and around the stairwell of the V House. The off-form, concrete-walled stairwell rises up and under a curving concrete ‘bridge’, the underside of which features the afore-mentioned Oregon textured finish. These two elements, the ‘bridge’ and the stairwell, read as one continuous flow of concrete, - down one side of the stairwell, continuing into the first tread of the stairs and up the other side to reconnect to the ‘bridge’. The design of the V House was largely dictated by a funnel-shaped building site. From across the river, the home presents as a linear series of modules. Delineated by concrete walls, floors and roof, it exhibits a lightness and sense of transparency. At the rear, a second pavilion angles away from the main one. The resulting ‘V’ creates a private, north-east courtyard and pool area. Within the courtyard, the wall of the main pavilion is clad with timber slatting – acting both as a shading device and a foil to the other materials. Another big plus for concrete, according to Lockyer, is its Ecologically Sustainable Development (ESD) credentials. “Thermal mass, in my opinion, is still the best way to moderate the temperature of an environment,” he says. Lockyer describes his ‘go to’ palette of concrete, timber and natural stone as ‘living breathing materials’. “If you want perfection, go and buy a Swiss watch,” he says.